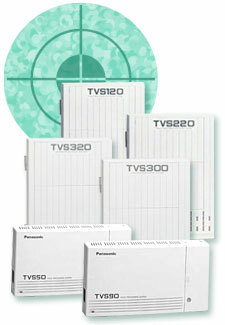 Panasonic KX-TVS Series voice processing systems offer much more than voice mail and automated attendant service. You also get versatile features and options, such as multi-lingual service and custom service that let you custom-design your system to meet your specific needs. Digitally integrating a Panasonic voice processing system with one of the Panasonic Digital Super Hybrid telephone systems* will provide additional advanced features that are only available from Panasonic. The auto-attendant answers incoming calls and routes the caller to the appropriate extensions or departments. Individual extensions can be set up with options for call screening, call blocking, or intercom paging. When this feature is utilized, the system records the caller’s name and announces it to the extension user before transferring the call. Each individual mailbox can activate or deactivate the feature. The system can collect the telephone numbers of your callers before, after, or instead of recording a message, and include it in your beeper notification. The caller’s number will be displayed on your pager, allowing you to contact that person without first having to retrieve his/her message. Now, you don’t even have to look at your phone to identify certain callers. With Caller ID1 Name Announcement, you can store up to 120 pre-recorded audio messages that will be played through the telephone’s handset, matching a Caller ID number that is programmed with a pre-recorded message. The System Administrator can assign up to 120 Caller ID numbers and program them to route the call to the desired extension, mailbox or custom service. As an alternative to routing calls to the voice mail system, each mailbox user can set a covering extension that can be used when he or she is not available to answer calls. Often used in conjunction with automated attendant service, custom service allows callers 1-digit access to department extensions, information announcements or other system features. For example, a caller could hear a menu as follows, "To hear our daily specials, press one…for directions, press two…"
The message lamp** on your extension will light. Your pager will alert you to call your mailbox. Your pager will display the telephone/intercom number of the caller. The system will call a predetermined telephone number to reach you. These notification methods can also be combined and programmed to operate in a specified sequence, so that the system can find you and alert you to important messages wherever you may roam. Mailbox owners can retrieve new messages simply by pressing the Message Waiting button; no confusing log-in codes are required. Allows you to pre-record a message and specify the phone number to be called and the time and date for the message to be delivered. If the destination number is busy at the specified time, the call can be re-dialed up to 15 times. You can even program in a password to ensure that your message is delivered only to the appropriate party. When a port receives a fax call (and CNG tones are detected), the system will automatically transfer the call to the designated fax extension. This eliminates the need for a dedicated fax line. The system can accommodate up to 20 custom greetings for holidays and can be programmed to play the special greetings on those days. Notifies you of an incoming call even if your extension is unanswered. The system will put the caller on hold, and use an internal or external paging function to announce "I have a call for..." You can answer the call from anywhere in your facility by just dialing a pick-up code from any system phone. Allows you to set up a mailbox that will deliver and record responses to up to ten questions. Use this customer-friendly service to take orders, conduct surveys, collect suggestions, or to record requests for appointments. Monitor your incoming calls while they are being recorded into your mailbox and, if desired, intercept the call. You can choose to hear your calls either through your telephone’s speaker or, for privacy, through the handset. Gives you the freedom to monitor your calls from the handset of any cordless phone whenever you must leave your workstation. You choose whether to pick up the call or let it go to your mailbox. The KX-TVS325 provides 4 ports, 1024 mailboxes and 128 hours of voice message storage. Stores messages on hard disk. Expandable to 24 ports. Features a software upgrade from the KX-TVS320 that adds 25 new features and improvements that will make the system program and use eaiser.